A new ransomware technique has been reported based on the apparent unsecure password information in corporate companies. Many have received an email in which a 'hacker' claims to have the recipient's password. 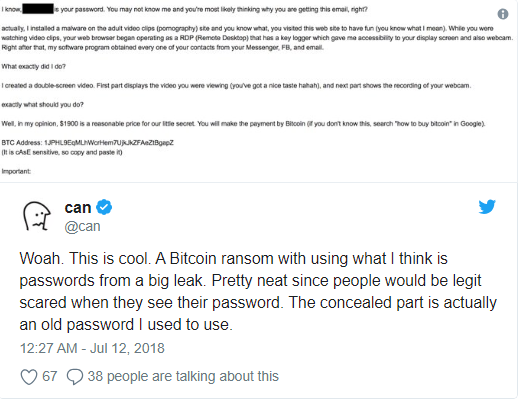 As expected, the password knowledge is used to scaremonger people into providing the sender with ransom money which is in this case, in the form of Bitcoin. However, the password in the mail is actually an old password meaning that this hacker has managed to access old leaked passwords on an online archive. This therefore means that this message is merely a scam, be it an extremely clever one. After getting in touch with other vicitms of this email scam, researcher Brian Krebs has claimed that in most cases, many of the passwords used were "close to ten years old" and that "none of the passwords cited in the sextortion email they received had been used anytime on their current computers," which is as impressive as it is terrifying. Accessing corporate accounts and old passwords is a new method for online blackmailing but it could be only a taste of what is yet to come. There is no denying that seeing your password written in an email from an unknown sender can be shocking but experts reassure that there is no way someone can access the webcam camera this way. To keep yourself protected against potential scams always cover your webcam when not in use and ensure you change your passwords regularly.